The Mercer Culinary M35110GY Hell's Tools 12" gray high temperature slotted turner's unique design makes it ideal for a variety of uses in any kitchen. The slotted 6 1/2" blade and beveled edge are great for picking up large or delicate items like eggs, fish, and pancakes without damage. Made from specially-formulated, glass-reinforced nylon, this turner provides greater heat resistance than plastic and can withstand temperatures up to 430 degrees Fahrenheit and 220 degrees Celsius. It's even stain and odor resistant to ensure product longevity. This is a great fish-spat substitute if using non stick pans. The plastic is highly heat resistant, strong, and flexible. Especially for the price, I was very happy with this purchase. This has become my go to flipper. It's delicate and flexible for eggs. It's robust enough to do burgers and heavier items. It fits m y hand well, and shows no sign of melting in higher heat situations. I would recommend having a couple of these in your kitchen. By far one of the best nylon spatulas on here. If you use non-stick pans you need one of these, or 10. Perfectly flexible but strong enough so it won't bend under the weight of your food. This 12” inch turner is great for almost any meal. I use this for breakfast meals like eggs and pancakes. It is light and easy to flip foods. I needed a new turner for my home kitchen and just could find anything I liked. This turned out to be perfect and has quickly become my go-to utensil. I guess it’s technically a fish turner, but it works for anything on a nonstick or stainless steel surface, and it’s flexible enough to fit in fairly small pans. You’ll find that this turner will quickly become your go-to out of all the ones in your drawer. The high heat capability of this turner makes it so versatile, from flipping pancakes to flipping food on a hot stone. Love, love, love these turners. I have added every color to the kitchen to keep things nice and clean. I always know which one goes with each dish from the color. This is a very inexpensive tool for your kitchen. Slotted turners are great for delicate items and this one features heat resistant construction up to 430 degrees. This tool is useful and very well priced. A completely solid turner. Holds up incredibly well under high heat. It's strong enough to turn heavier items, but with enough give to help turn lighter items without flopping. The only downside I see is that it's shaped to help right-handed people use it, making it a little hard for left handed people like me to use it as well. After a long search for high-quality turners I decided to give these a try.. When they arrived I was impressed with their sturdiness and the way they look. I have started using them regularly. They are sturdy enough for the tough tasks that I put them through (like breaking up ground beef and stirring thick beef stroganoff. Could not be happier with these. This mercer culinary hell's tools 12" grey high temperature slotted turner. This is my one of my favorite color shades. I do like the style of this turner. It is light and angled at the end to help with turning the food. We use this Mercer gray high temperature slotted turner for omelets and fried eggs. Turning them is so easy with this utensil. And this can be used in high heat so there is no worries of it melting off. The 12 inch length is just right. We like this utensil a lot. Perfect, all-purpose turner! The blade's tip is thin so it's great for flipping fried eggs. It's flexible and durable and is a great price for such a necessary item. Ordered and ordered again!! They hold up well to high temperatures and clean well. I would like to see spatulas available in this same design. Great high temperature turner with will will be sensitive for your scratch sensitive pans and pots. I use this one for cooking fish. I would recommend this product. I agree with some of the other reviewers, that the edge is not as thin and a typical metal slotted turner, but this is still nice. It works decently as a fish spatula, but if you are trying to move a particularly delicate piece of fish, I may recommend the standard metal turner. This is my new favorite spatula for cooking on non stick surfaces. Turning corn cakes is no problem, easily gets underneath to flip them. I even used it when I was caramelizing onions and it scrapped up all the bits on the bottom of the pan quickly. This grey mercer slotted turner is great for working with almost anything in a teflon coated pan. The nylon ensure no scratches and is nice and durable. Will buy more. I ordered this because my other spatula is not heat resistant and I had to always remember to not let it rest anywhere near the fry pan. I like this one a lot and use it to flip my eggs with every morning. Nice not to have to worry about it melting if it touches the skillet. Got two of these and they've been great on our non-stick cookware. They're firm without being so hard that they scratch, but still flexible. One downside is that lost of fond/pan bits stick all over the front edge when using it (but I think that's due to the plastic it's made from). This spatula is a good deal. It is not flimsy or limp. I have been pleased with the purchase. I also like the fact that it is available in so many different colors allowing you to designate for different purposes/cooks/areas of the kitchen. This is a great turner, it's super affordable and durable. It's stiff and wide enough that it is perfect to use for stirring salads, etc. We purchased this turner because it was listed as "high temperature." The very edge melted on our first use with eggs. It is still useable for some products but nothing that requires a nice sharp, straight edge (ie: baked goods). Thank you for your review! We're sorry to hear your turner didn't meet your expectations. For a more temperature resistant turner, try the Mercer M18390 Hell’s Handle High Heat Turner. This turner can withstand temperatures up to 450 degrees and have a stainless steel beveled edge that will remain sharp and not melt. This has been a nice, simple turner I use with cookies and other baked things. It's rigid enough and I haven't had the front edge get weird and flake off like some other cheap turners in the past. I definitely should have bought this one earlier. I find that it works much better than the usual flat spatula to turn things. Great for non-stick pans, highly recommended. This plastic spatula is great to have in the kitchen. Its perfect for flipping fish or other delicate items. Its resistant to high heat which is perfect. Thigh heat turner is great to use on your non stick pans. Works great for turning or just stiring. You can't beat the price. And forget the ones at the stores. My favorite turner for pancakes and omelets. This is a little narrower than most turners, so it's perfect to lift up the edge of pancakes, crepes or omelets and flip them over. These are great for use with non stick pans. They are ideal for pan searing fish either in a non stick pan or a cast iron pan. 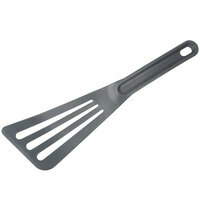 What made me purchase this spatula is foremost, it can withstand high temperature and second, its great for nonstick pans. A two for one deal! What a wonderful turner for cooking eggs on the flat top or in a skillet! Easily withstands high heat! Nice for pan searing fresh fish!!! I love using this turner, I have really put it to the test, frying with hot oils, fried eggs go over very easy. This turner has not melted nor become distorted like other brands have done. I will purchase more of these and recommend to others. This is a very cool turner! We purchased this turner to use on our non stick pan so we don't scratch it. It's long design makes it ideal for scraping up tilapia and other fish. I love this turner. Combined with the Volrath Ceramiguard rivetless nonstick pans, you have your tools to go into battle against eggs and fish. The plastic has shown no signs of warping and it fits well even in 7 or 8 inch frypans. While inexpensive, this is a very solid product. Even exposed to very high heat, the plastic does not melt. It is perfect for turning crepes made on a non stick crepe pan. I actually bought two of these for my house, because our old turners were getting really...in need of replacement! These are great - easy to clean and I put it in the dishwasher (top rack) with no problem. Easy to store on a pegboard, and super lightweight and thin. Perfect for omelets! Works great. It is perfect for fish. This is the only turner/ spatula that I use now. It is a little tough to use at first in an egg pan due to its stiffness but once you get the hang of it it works perfect. I really like this turner. It has become a very well used item in this kitchen. I find that I am able to use it not only for fish but frying eggs without the yolks breaking. Great for my Teflon pans. Quality item no kitchen should be without. The tapered end adds to the ease of use, making this item a must for that master chef in you.